If you read this blog often or know me personally, you probably know that I love a good bargain! Not only do I enjoy being a good steward of the finances entrusted to us, but I also really enjoy helping others save money, too. 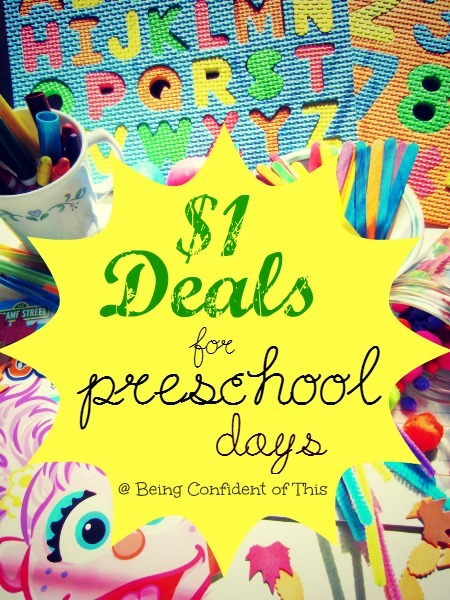 So, as a follow-up to Free Resources for Teaching Pre-K at Home, I thought I would share with you all of the dollar store deals that we currently use in our homeschool preschool. Dry-erase workbooks (Shapes & Colors and Numbers) – I love that we can use the dry-erase workbooks pictured below these over and over again. What a deal for only a dollar! Dry-erase writing practice board – We found one of these several years ago at a dollar store. It looks like a sheet of handwriting practice paper but is made of dry-erase board material. Foam puzzles – Our son is more of a musical and tactile learner, from what I’ve observed so far. So these foam puzzles for letters and numbers are a great dollar deal for him! Our daughter really enjoys them, too, and she has learned several letters on her own just from playing with them. Small board books – I always look for these dollar store deals. Sometimes I give them as gifts, but often I find books that help teach early childhood concepts such as shapes, colors, letters, numbers, and so forth. We also enjoy any books including nursery rhymes since rhyming is an important reading skill and bible stories, which seem to be easy to come by at our local dollar store. 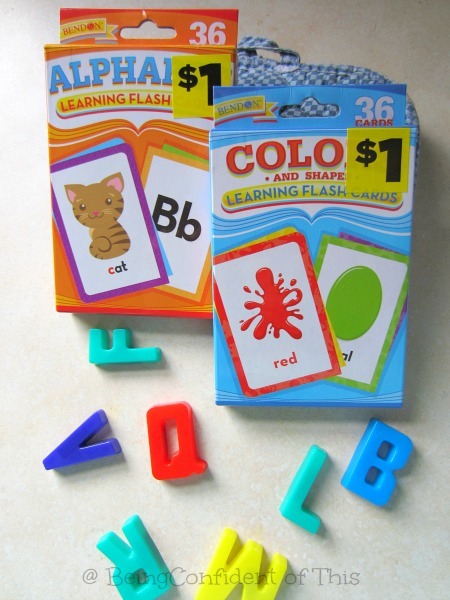 Flash Cards – We play fun games with these alphabet flashcards and colors & shapes flashcards. Sometimes we play Go-fish with them (you will need more than one set of alphabet). We also play a game where they get to run to me from across the room and get the card after they recognize it (and then I ask them to recognize it again when we put them all away). We play jump on the correct flashcard, run to the correct card, and even swat the card, a modification of this mom’s idea (which is by far our son’s favorite!). Fake money – This is on our list of things to buy. Our kids love counting money, and at the same time they begin to learn the names of the coins! Magnetic letters – Our daughter is really catching on to phonics lately, so the magnetic letters are great for showing her how to build words! You don’t even have to use them on the fridge -if the homeschool area in your home lacks a magnetic surface, just grab a cookie sheet. 🙂 Use for letter recognition, letter matching, and word-building. Colored wooden craft sticks (popsicle sticks) – If you get lucky, you might find these colored craft sticks at your dollar store. We use ours for color sorting using these color mats, counting, patterning, creating shapes or letters, etc. Colored card-stock/index cards – I bought some colored card-stock and a pack of index cards at the beginning of our preschool adventure, and I’ve used almost all of the index cards already. I use them for all sorts of things, but mainly for creating my own flashcard sets like the one found here or counting cards like these. I like mounting the index cards to cardstock to add a little color around the edge and to give them more stability. **This post contains affiliate links. Jen is a participant in the Amazon Services LLC Associates Program, an affiliate advertising program designed to provide a means for sites to earn advertising fees by advertising and linking to amazon.com. Thank you for helping to support the ministry of this site! 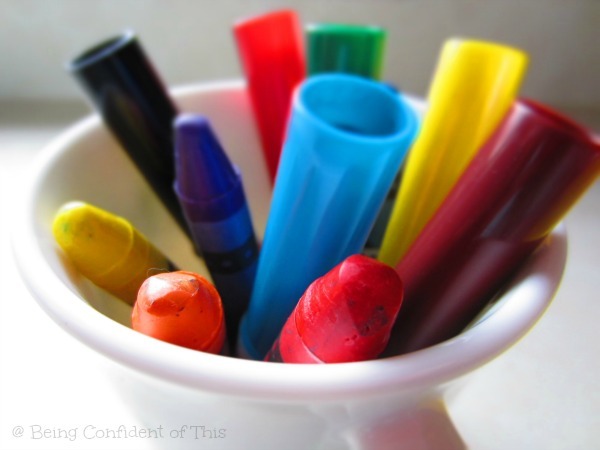 Small, chubby markers – I love the set we found at our dollar store because they are washable and the size fits our preschoolers’ hands much like the oversize crayons do. The size makes it easier for toddlers and preschoolers to maintain a correct grasp. Miscellaneous – Large crayons, construction paper, hole punch,scissors, glue sticks, paints,dry erase markers, and more can all be found at the dollar store. The only reason I mention them is that they often cost more at other stores than at your local dollar store (unless it is back-to-school season). 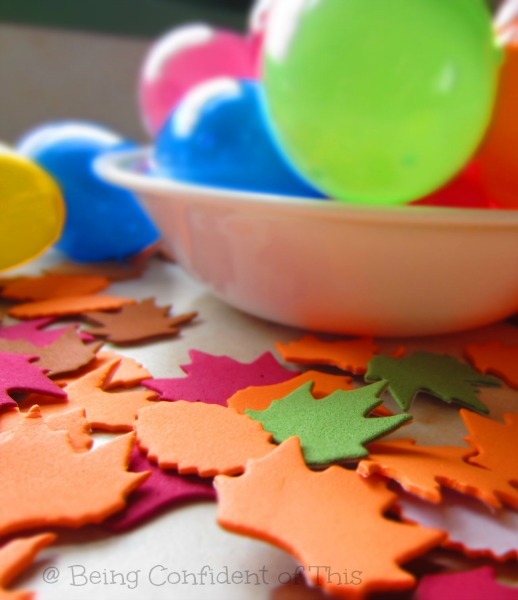 Small party favors – I found some tiny cars for our son and some pretty beads for our daughter, but any small objects will do (just be aware of choking hazards!). Use them with your counting cards, mentioned above. The next time we go to the dollar store, I hope to find some bugs and a few other small things. 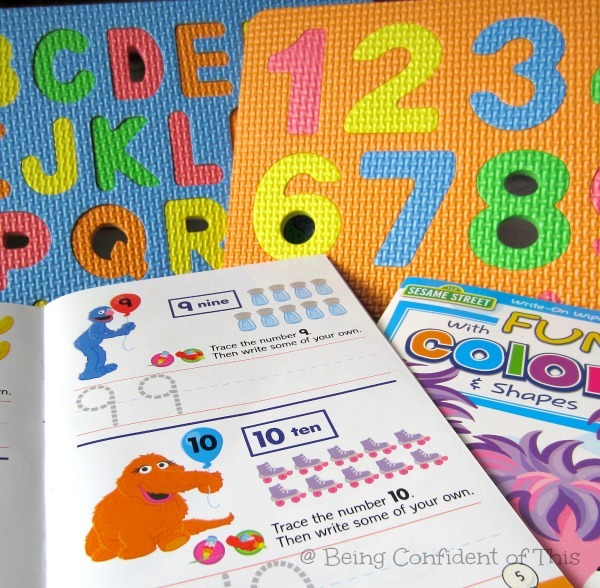 These dollar store deals are great for counting fun, beginning math, sorting fun, and more! Marbles – Marbles provide sensory fun for kids of all ages, but for our home preschool we mainly use them for counting. Bingo Markers – We use these for do-a-dot sheets like the ones found here or for creating our own patterns. If you can’t find them at your local dollar store, check for good prices online (like the set below). Playdoh – Playdoh is amazing for building those fine motor skills and (bonus!) it’s just a lot of fun to play with! Use a variety of colors for homeschooling by creating letters with these playdoh mats or shapes with these playdoh mats. 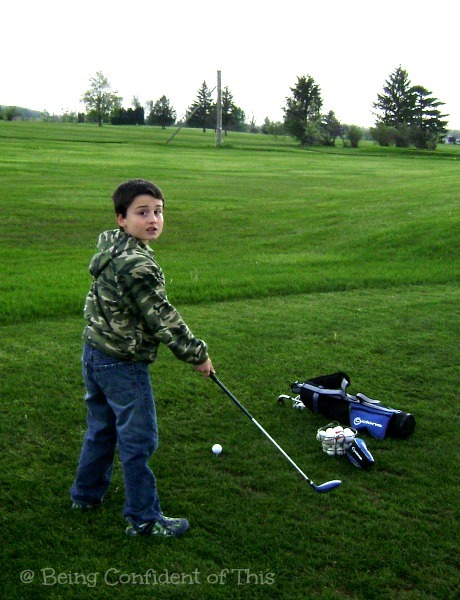 Or take a step back from directed instruction to allow for some free play time. Straws – They are so versatile for early childhood education (and beyond)! We use ours to compares sizes (bigger than, smaller than), to form letters and shapes, to count, to create patterns, and so forth. 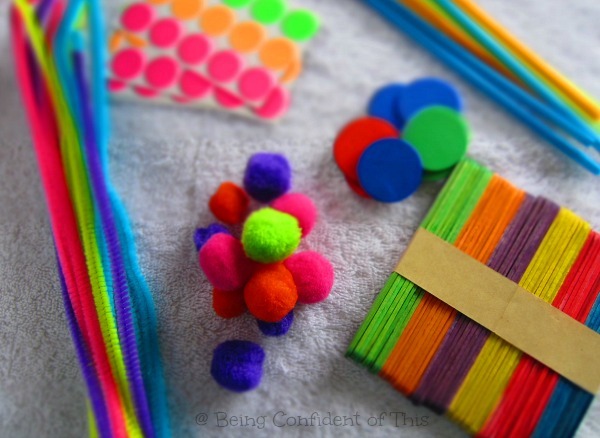 You can even cut them to short lengths and string them on yarn for fine-motor skill fun. To be honest, most of our preschool/homeschool supplies have come from dollar store deals since we are trying to homeschool as frugally as possible. I’m thankful God has provided for us this year as we teach our twins preschoool at home. If you have any other great dollar store deals for early childhood education or homeschooling, leave a comment and let us know! There are times we feel like we can’t win and want to just ‘get out’ of the fight. I’m not talking about the wars we hear of on the daily news, the battles our soldiers fight on land with guns and tanks . . .
I’m talking about our personal wars. Life’s daily struggles. We fight to maintain schedules, to make deadlines, to control our eating, to get to the gym, to give when we’d rather hoard, to be kind when we are under pressure, to cook and serve another meal, the list goes on and on. But here is what I think is the crux of it all: The core battle is the one fought in our souls for our identity. 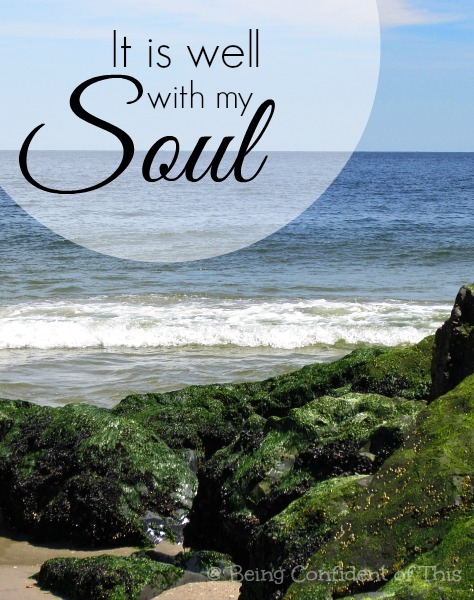 I’ve written about the soul-hole, how we are born with a cavern that needs to be filled with love and only God’s perfect love can complete us. Though we know that, we don’t always live it. Often, I think it is because we don’t know how to fight. We think we have to fight for validation, but we already have it. Christ who came to redeem us from the curse of broken identity has already validated us. We don’t fight for victory, we fight from it. In this series we want to explore how to walk in victory, to teach what we have learned and to learn from one another. The battle won’t cease until we are done with this life and completely free from our old skin. But we have been given what we need to stay the course while we are here. 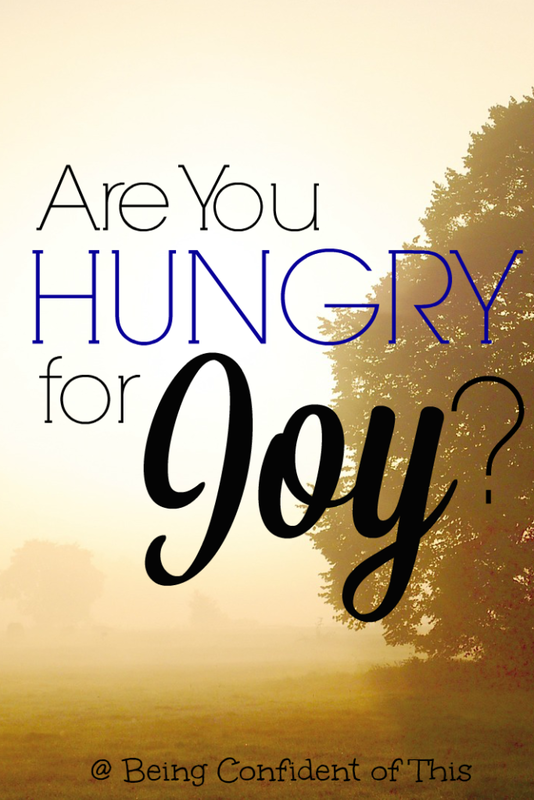 Are You Hungry for Joy? 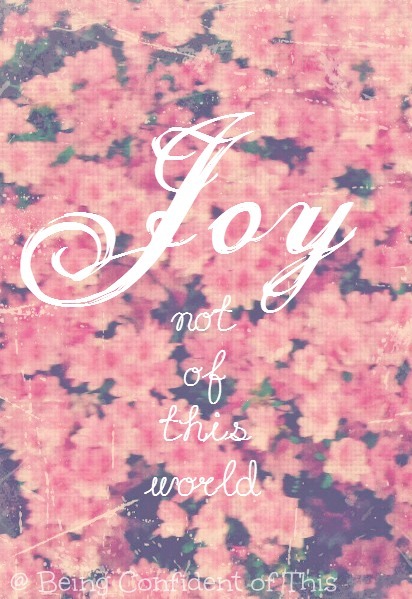 We hear people say it, “choose joy” as if it is a thing readily available for the taking. Just reach out and grasp it and it’s yours to keep. And some think they’ve found it in a nice house or pretty clothes or a fulfilling relationship, while others are just plain hungry for it. We think we find joy in children’s laughter, walks on the beach, sunny days, a good book. We claim joy in date nights, a healthy bank account, a successful career or ministry, good health, full stomachs, any and all of those blessings we’ve counted up. We look for joy always in all of the created things; we crave it. But all of these things, even these people, they are are fleeting, friends: here today, gone tomorrow. Any joy based on these moments, on temporary possessions or circumstances, is destined to pass. When that happens, we feel cheated somehow, don’t we? We feel let down. We may even wonder if something is wrong with us or question why the joy is gone. Have you been there before? When the sunshine suddenly turns to rain, when laughter turns to pain? I’ve walked through seasons where joy seemed scarce and even counting my blessings, though they are many, wasn’t enough to satisfy my soul. I’ve found myself hungry for lasting joy, one not of this world. True joy, lasting joy, comes from one source and one source only – the Father God who created us purely for love’s sake. His only Son took upon Himself the burden of the cross “for the joy set before him” so that we might have joy unspeakable. Are you looking for it today, friend, the kind of joy that lasts through the hard times and back again, the kind that wells up from within, unstoppable? For You, O Lord, have made me glad by what You have done, I will sing for joy at the works of Your hands. O come, let us sing for joy to the Lord, Let us shout joyfully to the rock of our salvation. It’s Five Minute Friday again, so I’m joining up with the lovely ladies over at Lisa Jo Baker’s place for a stress-free, five-minute, free-write on a one-word prompt. Join us if you like! Today I’m sharing wise words from my friend Arabah Joy about our value. Noise. Our lives are surrounded by it. It bombards from within and without and much of our daily noise serves one purpose: to tell us how we are measuring up. It tells us what we are… or aren’t. It tells us we are worthy, successful, valuable, up to par… or we, simply, are not. It tells us we can take it easy on ourselves… or we need to try harder, do more, drive ourselves further. As tempting and overpowering as these things may seem, we need not give place to them in our hearts. God’s Word tells us that greater is He who is in us than he who is in the world. We can face the noise of our lives well equipped for triumph, grace, and confidence. 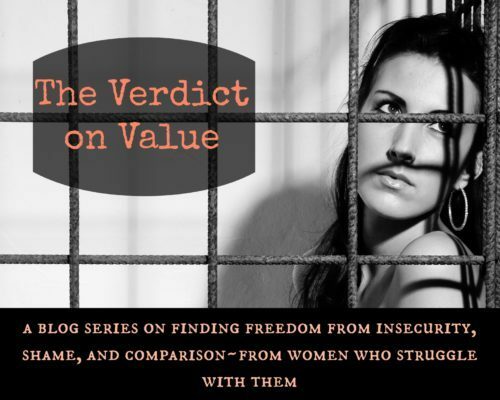 I am pleased to be part of a brand new series entitled “The Verdict on Value.” This series is about standing in confidence in a dog-eat-dog world and is brought to you by a group of blogging friends who have seen firsthand the damage comparison, insecurity, shame, and the like can do. 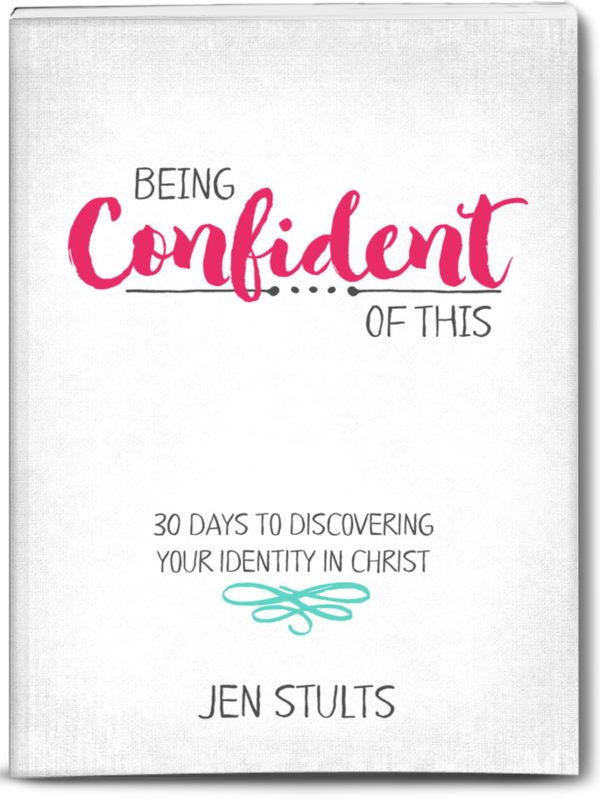 Throughout this series we are going to share our stories and temptations with insecurity… and how Christ has worked in our lives to free us. We woke at our usual Sunday-morning times and showered and bathed the little ones. We ate breakfast and dressed in our Sunday-morning clothes and tied shoes and added bows to ponytails. The morning routine was going relatively smoothly until the phone rang. For most church-going families, this would result in either skipping Sunday School altogether or making a red-face, apologetically late entrance. But I’m married to the Pastor. So, forgetting to “spring forward” meant people sitting in the sanctuary, sitting and waiting on us. At first, the perfectionist in me was sorely tempted to give in to crankiness. Why would the Lord allow us to make such a noticeable and embarrassing mistake?! How could we have missed daylight savings?! Somehow, I had missed every possible reminder of the upcoming time change and was honestly clueless. Right then and there, I decided blaming God wasn’t going to help and neither was blaming myself. Although forgetting to change our clocks was incredibly humiliating and humbling (and it WAS), it could not have been prevented in any way. 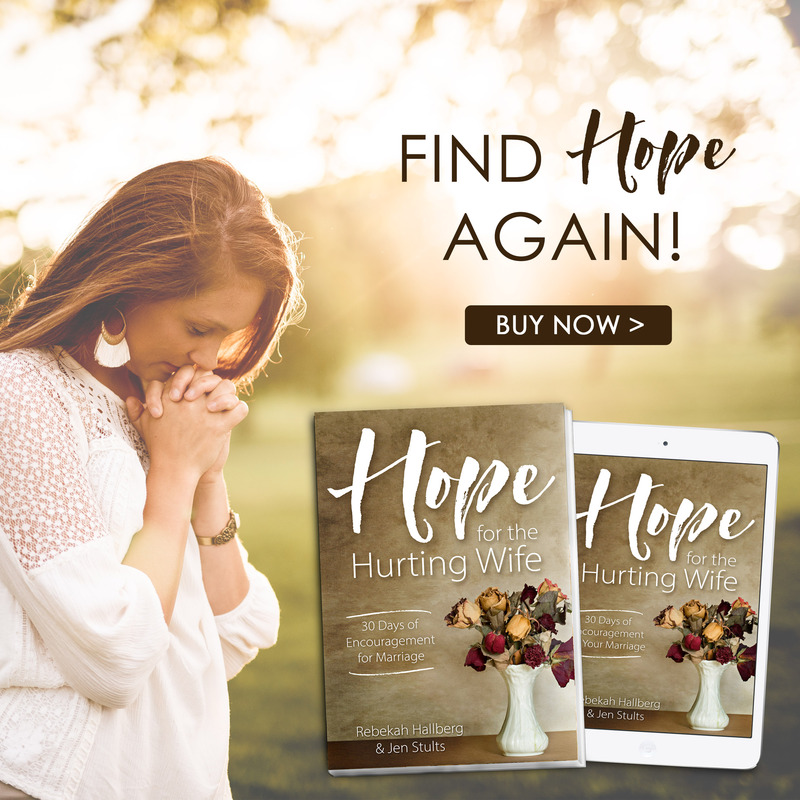 So, when my husband, the pastor, received the call that meant we were shamefully late, I decided to let it go, to trust the Lord, knowing my own conscience was clear. Knowing that while others might have the right to complain, we could handle it with grace. You see, the Father’s been teaching me lately how little the approval of men matters in the larger scheme of things. He’s been teaching me instead to look towards His Son for the approval that I seek. He’s been stretching my ideas about grace. By the time we made it to church, wet hair and all, Sunday School was already halfway over, but we made the best of it. I was a little afraid my husband might be chastised, but thankfully our small, country church is full of kind and gracious folks. And wouldn’t you know the Lord had a word for us today, a word for me. Wait – it gets even better! The very best part of God extending a mulligan to the people of Nineveh (and to those of us who trust in Him today) is that no record of previous wrongs exists. The second chance takes the place of the first, wipes it completely out of existence, as if it never, ever happened. That argument with your husband – wiped out. Those harsh words spoken to your children – wiped out. The thoughts you had about that hard-to-get-along-with person – wiped out. The extra bites of brownie you took – wiped out. The time you wasted on frivolous things – wiped out. The decision to ignore the Holy Spirit so you could have more “me” time – wiped out. The worry, the coveting, the greed, the jealousy, the impatience, the lack of self-discipline, all of it – wiped out. And the victory that is ours to cling to will come. It will come. It will come, sisters. 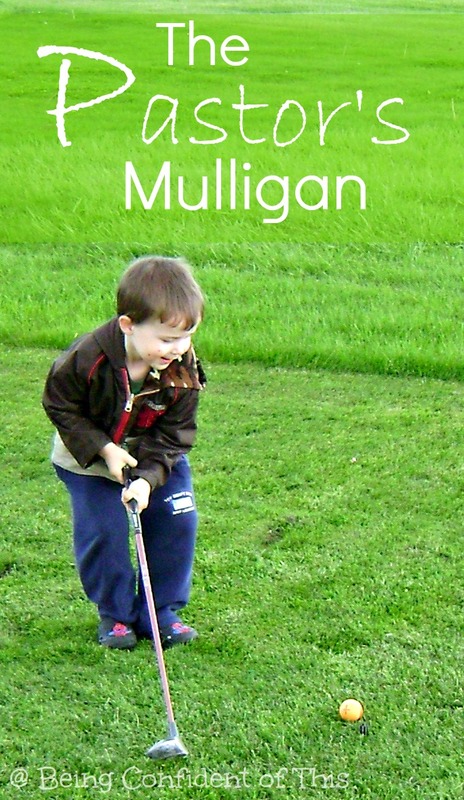 Because by the blood of the Father’s son, Jesus, we possess unlimited mulligans. And in our humility, we see clearly His greatness. *You may also find me at any of these lovely places. Last week I shared part 1 of how we clothe our four children on our single-income budget. Today, I’m sharing the second part of how we save on kids’ clothes, including how we take advantage of end-of-season clearance to buy new clothes a year ahead for our children. In our area, we have a few choices for second-hand clothing stores specific to children. By far, my favorite is Once Upon a Child. Most of these stores will screen the clothing they take in (as opposed to accepting anything like some second-hand stores to). Prices reflect the value of clothing items, based on condition of the item and name brand. So, when you buy from such stores, you can be fairly certain that you are buying clothes that are free of holes, stains, rips, excessive fading, etc. 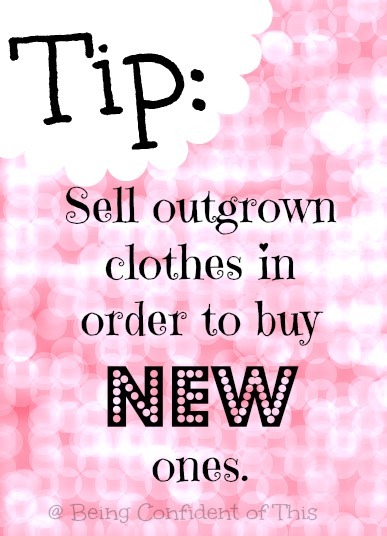 What makes stores like Once Upon a Child so attractive to me is the ability to sell your own gently used clothing to the store in exchange for either cash or store credit! I really appreciate this feature for my daughter’s wardrobe since many of her items are still in excellent condition as she is the only girl. Tips: many of these retailers also accept toys, books, puzzles, baby items, and more. Second-hand stores offer a good source of gently used clothing, especially when garage sales are out of season. Local second-hand stores, rather than chain stores like Goodwill, often offer the best value. We have a store in our small town that charges only twenty-five cents per clothing item. Tips: Look for 1/2 price days or weekends at chain stores (Goodwill’s is once per month), sack sales, or coupons to save even more money. Pros: save money buy buying second-hand rather than new, wide variety of items, support charity when shopping some stores. Cons: prices are often much higher than garage sales (and sometimes even store clearance), some clothing isn’t in the best condition. If you are tech-savvy and enjoy shopping online, you can find some great second-hand deals on facebook or craigslist! Many towns and counties have developed online garage sale type pages for users to sell clothing (and other items) locally, much like Craigslist only via facebook. I have both sold and purchased clothing items on such a group, and the transactions really depend on the people you are dealing with. Some sellers/buyers are very honest and easy to work with, while others are just out to make a buck. Also, safety can be a concern since you will have to meet the party who is selling/buying in order to complete the transaction. Always, always, always meet in a public place and never go alone if you can avoid it. Shopping end-of-season clothing in particular allows us to buy new, quality clothing at second-hand (sometimes even garage sale) prices. Such items are particularly helpful for our boys since most items will be handed down twice, and some even survive well enough to be passed on to younger cousins! However, clearance shopping is one area in which I must exercise caution. The excitement of a good bargain often leads to over-spending or over-buying (how many skirts does one preschool girl really need?!). Additionally, department stores thrive on marking items up and then promoting a sale thereby convincing consumers they are getting a bargain when, in truth, they are not. So, before I share my rules for clearance shopping with you, I must caution you not to blow your clothing budget by making the same mistakes I have. Tips: Before you attempt to shop end-of-season sales for next year’s wardrobes, know your prices (takes time and research), know your budget, and know your needs (keep a list if you need to). My favorite stores for buying quality clearance clothing are JC Penneys, Kohls, The Children’s Place, Old Navy, and occasionally Walmart. Why buy a year ahead? Whenever possible, I take advantage of seasonal clearance to buy a year ahead for our children (I mentioned this in Part 1 in the Garage Sale section). Thinking ahead is a technique I learned from couponing, and it makes a lot of sense. When prices are extremely low, buy more than you need for the present so that when you need the item in the future, you will not have to pay regular price. For clothing, that translates to buying a size or so larger for the next year. For example, when summer clothes go on clearance, I think about what they will need for their wardrobes next summer, including swimsuits and footwear. Thinking ahead is particularly helpful for items that tend to be more costly, such as Easter and Christmas dress clothes. Example: Once I found a toddler boys’ Christmas suit (vest and tie included) for $1.97, so I bought it even though it would not fit our son for 2 more years. The only two downsides to buying ahead is that your budget might not allow for extra purchases (even frugal ones) and you may not have the storage space necessary to keep clothing for a year, especially if you already have several children. In those cases, check for an area of the budget you can pull a little extra cash from (such as food) and ask friends or family for storage space in a garage or attic. Once you have built up a little clothing in storage, buying ahead will not be as much of a stretch for your budget because you won’t be purchasing as many items for immediate needs. 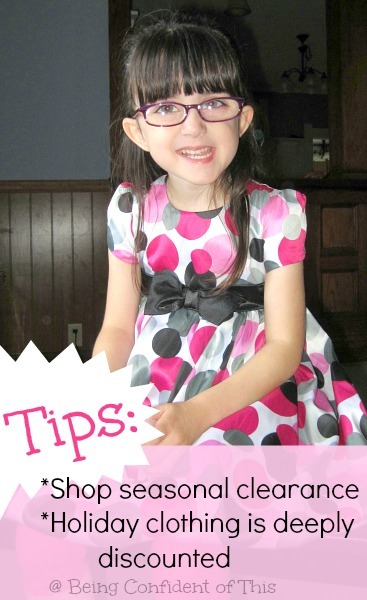 Tips: Be sure to pay attention to how their current clothing fits and their general body type. For example, I’ve learned that our children all have my husband’s long torso, so I usually have to buy one size larger in shirts than in pants. Additionally, our only daughter is quite thin, so regular pants often look like clown pants on her. Thus, when buying ahead for her, I only purchase leggings and skinny jeans or slim sizes. 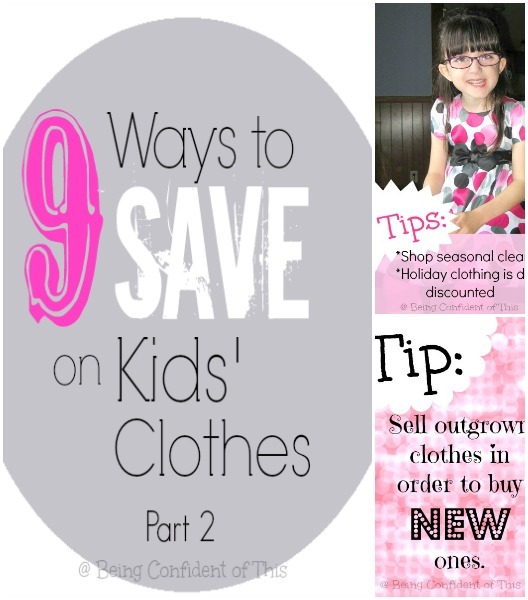 That wraps up part 2 of how we save money on kids’ clothes in an effort to live frugally. Saving money on clothing is just one way that we stretch our budget; for more ideas, read 5 Ways to S-t-r-e-t-c-h a Budget. I hope you find this information helpful! You may find me linking up at any of these lovely places. It’s the first thought that runs through my head. And the obvious choice. Yes, I choose Jesus. I want to serve the Father. I want to follow hard after Him. But some days, the choosing is a struggle, isn’t it? The choosing is easy enough when the sun shines and the warm breeze blows and the blessings flow and joy abounds. But what about those days when the fiery darts strike in quick succession? And just as you rise, the wind gets knocked out of you once more? Those days the choosing feels near impossible. And that’s exactly what our Enemy wants, my work-in-progress friends, for us to feel helpless! We just want to cry, “mercy” and throw in the towel, admit defeat. We’re so overwhelmed by the struggle that we have little left to give. Those lies about our failings will carry us right away if we let them, won’t they? Carry us right away into a sea of despair, a void of apathy, a pit of depression. 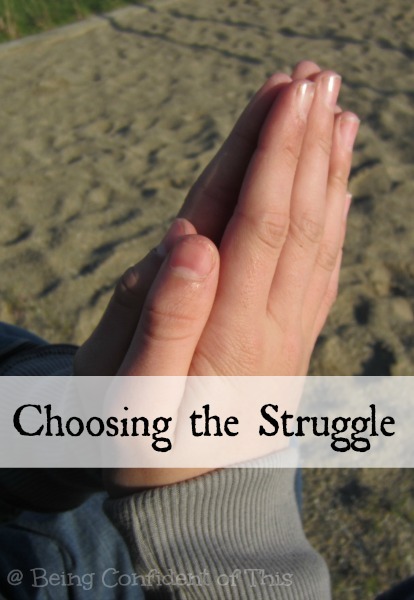 What if we choose the struggle instead, friends? In those times when we can’t find it in ourselves to choose joy, when we can’t count our blessings for the crashing waves before us, when we feel incapable of making a choice at all, maybe it’s enough just to choose the struggle. Even though we may not be winning, we choose fighting the good fight. We don’t give up, we don’t give in. Even though we fear defeat, even though we falter for a step or two, or even a mile or more, we choose to press on. What if we throw off the chains of perfection and choose instead the road of imperfect progress?Maybe even some days that road looks less like progress and more like a struggle for simple survival. Those are the days we count it a victory just to finish out with our faith still intact. So we fight by faith! By faith, we wait on the Lord. By faith, we cling to the promise of grace and we seek His face. 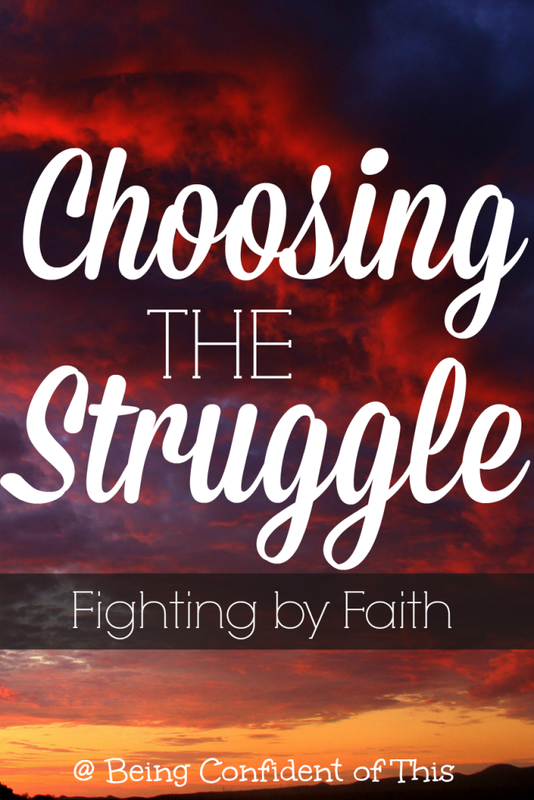 By faith, we choose the struggle, day after day after day. And some days, that’s the best choice we can possibly make. Let’s choose it together, friends. It’s the choice that leads to victory! Sharing with #TheLoft and Grace and Truth.